Standing from left: Interim Dean Mark Cordes, Priti Nemani (’12), Regina Harris (’89), Rep. Barbara Flynn Currie, Karen Baker (’98), Melinda Rosales Byerly (’03). Seated from left: Hon. James F. McCluskey (’79), Dean Emeritus Leonard Strickman, Hon. Hyman Riebman (’78), and Louis Apostol (’78). NIU College of Law Interim Dean Mark Cordes and the NIU Law Alumni Council celebrated alumni and friends who embody what is best about the College of Law during our 2018 Awards Reception on September 26 at the Union League Club of Chicago. 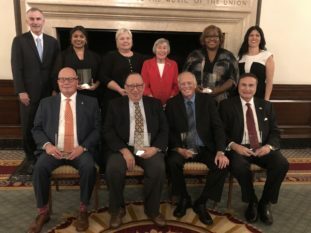 The eight honorees were recognized for their career accomplishments, devotion to the public good, continued service to the law school and professional integrity in their work in the public and private sectors. During his 39-year career as a practicing lawyer, the Honorable James F. McCluskey has tried over 60 juries to verdict and has handled numerous cases involving complex civil litigation. In 1990, he was a founding member of Momkus McCluskey LLC, concentrating in transactional, commercial litigation and insurance defense litigation, family law, estate planning and real estate transactional law. The firm grew from three lawyers and one client to 28 lawyers and thousands of clients. In June 2018, he was appointed as an Associate Judge to the 18th Judicial Circuit, DuPage County. Judge McCluskey is also President of the Illinois State Bar Association, which serves more than 33,000 members statewide. Besides the Illinois State Bar Association, he is a member of the DuPage County Bar Association, West Suburban Bar Association, and the Illinois Trial Lawyers Association. His awards include the highest rating by Martindale Hubbell, the Super Lawyers’ list of the best Illinois lawyers for the past ten years. In 2005, the DuPage County Bar Association awarded him the Ralph Gabric Award for distinguished leadership and professionalism. In 2008, he received the Lawyer of the Year Award for distinguished leadership and meritorious service for the DuPage County Bar Association and its members. In 2018 he received the Alumni Achievement in Public Service Award from Northern Illinois University. Priti Nemani founded Nemani Law, a diversity focused transactional law firm representing clients in a variety of commercial and residential real estate transactions, general corporate matters, estate planning, probate and trust administration. Active in the community, Priti is Vice President of Programming and head of mentorship for the South Asian Bar Association of Chicago. She also mentors new professionals and law students, as well as works with the Professional Women’s Club of Chicago, the Dynamic Professional Women’s Network, and the Women’s Council of Realtors Chicago Chapter. Priti volunteers regularly for the American Foundation for Suicide Prevention and The Anti-Cruelty Society of Chicago. As an author, she has published full length articles in the University of California-Berkeley’s Asian American Law Journal, the University of Hawaii’s Asian-Pacific Law and Policy Journal, the Illinois Bar Journal, and the Kane County Bar Briefs. Judge Hyman Riebman (ret) began his legal career as a Cook County Assistant State’s Attorney, and thereafter went into private practice for over 20 years before becoming a judge in the Circuit Court of Cook County, Illinois in 2001. The Chicago Bar Association wrote when evaluating him that he “is well regarded for his knowledge, experience, outstanding temperament and demeanor.” Judge Riebman has been a presenter in numerous seminars and forums. Additionally, from 1999-2000 Judge Riebman served as President of the Northwest Suburban Bar Association and later served on the Board of Governors of the Illinois Judges Association. For over 17 years he has served in the Circuit Court hearing criminal and civil cases before being assigned to its Domestic Relations Division during his last six years on the bench. In July 2018, Judge Riebman retired from the bench, and in August 2018, he joined the law firm of Grund and Leavitt practicing in the area matrimonial law. Karen Baker recently retired from Northern Illinois University with 30 years of service, beginning her career as a Financial Aid Counselor in the Student Financial Aid Office in 1988 and Educational Services and Programs and as a CHANCE Financial Aid Counselor in 1991. Karen joined the newly created Center for Affirmative Action and Diversity Resources (AADR) in 1999 as a Compliance Coordinator of Diversity Resources and Affirmative Action Associate. Most recently, she served as the Associate Vice President for Affirmative Action, Employee and Labor Relations for Affirmative Action and Equity Services in Human Resource Services. In this capacity, she also served as the EEO Officer and Title IX Coordinator for the university. Karen served on several committees and commissions, taught a civil rights course in the College of Law and was the recipient of several awards including the Presidential SPS Award for Excellence and the Deacon Davis Diversity Award recognizing her commitment to diversity. She is a proud wife and mother of three. Karen recently organized The Lil’ Sam Joy Fund in memory of her 15 year old son Sam Paul II, who had Down’s Syndrome, with the purpose of providing financial assistance to students with developmental disabilities in the DeKalb School District. This labor of love has by far been the most rewarding of her accomplishments. Louis Apostol is the Public Administrator of Cook County. He formerly served as the Executive Director, general counsel and legislative liaison for the Illinois Property Tax Appeal Board (2008-2017). As Executive Director, he was responsible for the management and adjudication of all residential, commercial, industrial and farm property tax appeals in Illinois. He has been a practicing lawyer in Illinois for over 30 years and was a partner in several large law firms in Chicago specializing in civil and criminal litigation, tax, finance, property, administrative and government law. He served as a Commissioner/ trial judge on the Illinois Court of Claims (2003-2008), hearing complaints against the State of Illinois. He served as Public Administrator of Cook County, managing the litigation and administration of over 2,500 cases (1991-2003). He was appointed a Special Counsel for the City of Chicago and is a member of Chicago Sister Cities International, as an appointee of the Mayor (1992-present). He served as Chair of the Attorney’s Advisory Committee for the Clerk of the Circuit Court in Cook County. He is an active member and contributor to many charitable organizations such as the Diversity Scholarship Foundation, “Leadership 100” and served as the President of the Hellenic Foundation in Chicago. He was elected to the NIU National Alumni Association Board of Directors in 2015. In 2016, he was elected to the Associated Colleges of Illinois Board of Directors. In 2018, he was appointed to the position of Distinguished Advisor to the National Hellenic Museum in Chicago. State Representative Barbara Flynn Currie (25th District) is the first woman Majority Leader in the history of the General Assembly. As the second ranking official in the House of Representatives, she works closely with legislators from both parties and all regions of the state to address the challenges facing Illinois. Rep. Currie’s legislative accomplishments include sponsorship of the Illinois Freedom of Information Act and the expanding the Illinois Earned Income Tax Credit to reward more working families. She has fought to protect those who blow the whistle on corrupt public officials, toughen revolving door prohibitions on former state employees and prohibit sexual harassment in the workplace. Currie has passed laws making it easier for Illinois residents to vote by allowing online voter registration and same-day voter registration, protect juvenile court records, prevent the abuse of nursing home residents, improve child-support enforcement and expand the protections of the Equal Pay Act to prevent discrimination in the workplace. To help give workers the peace of mind they need, Currie passed a new law requiring Illinois businesses with at least 25 employees to offer retirement savings plans to their workers, making it easier for employees to save what they’ll need for a more secure retirement. The Secure Choice Savings Program will allow more than 2 million workers who previously did not have access to retirement savings plans at work to participate in an IRA. Dean & Professor Emeritus Leonard Strickman spent 48 years as a faculty member at five American law schools, more than 25 of those years as dean of three law schools, including the nine years he spent from 1981-1990 as the first dean (not in an interim capacity) of the Northern Illinois University College of Law, after its transfer to NIU from Lewis University. He spent his first year, in addition to normal decanal responsibilities, supervising the physical transfer of the College of Law from Glen Ellyn to DeKalb. Over his first year as dean, he led the law school from provisional to full accreditation by the American Bar Association, and a year and a half later (the shortest time permissible under the rules) to membership in the Association of American Law Schools. In 1991, a year after he stepped down from the deanship at NIU, Strickman was appointed Dean of the University Arkansas School of Law, where he served for eight years, before moving briefly back to full time teaching. In January 2001 he left Arkansas to become Founding Dean of the Florida International University College of Law, located in Miami, a position in which he served until 2009, when he again returned to teaching until his retirement in 2016. Regina Harris began her legal career at the Kane County Public Defender’s Office and served as first assistant until 2007. In 2007, she became the Chief DeKalb County Public Defender until 2012. Regina then entered private practice at Smith Wykes practicing family law, small business representation, transactional, and real estate development. She now has her own firm, Harris and Associates in Sycamore, IL. Regina is the current director and president of National Alliance on Mental Illness for local Kane, DeKalb, Kendall Counties affiliate. She is the former director and president of Tails Humane Society. She also served as a long-time member and president of the NIU Law Alumni Council. Regina has been a mentor in the 1L Mentoring Program since its inception in 2009. Copyright © 2019 Board of Trustees of Northern Illinois University. All rights reserved.